To help celebrate composer Stu Philips’ upcoming 80th birthday, Southern California’s most lavish movie palace, the Warner Grand, is throwing a party! Great music is a must if you really want to make a party swing, so the theater’s house band will be busting out extended suites from some of Stu’s most popular work, including the scores of Knight Rider, Buck Rogers in the 25th Century and Battlestar Galactica. In this case, the “house band” is the Golden State Pops Orchestra, and the band leader will be none other than Mr. Philips himself! 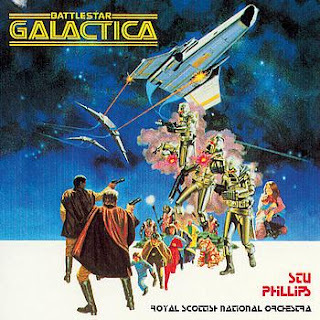 Thats right, ladies and gentlemen – if you just happen to be in beautiful downtown San Pedro (less than an hour from Los Angeles) on Saturday, October 24th at 8pm, you’ll get to hear music from the original Battlestar Galactica performed with a full orchestra conducted by Stu Philips. And if that’s not enough to make your BSG-loving head put a crack in the ceiling, Stu will be joined by special guest Bear McCreary, on hand to conduct a brand new, extended version of the Galactica theme being written especially for this event (Bear’s keeping mum on what exactly to expect from his new composition, but he did say it will include musical elements of both series). Mojo also notes the recent birthday of the original BSG. Jamie Bamber guest starred on the season 2 debut of Dollhouse on Fox joining his BSG co-star Tahmoh Penikett. Maureen Ryan reports that Michael Hogan will guest in the 3rd episode this season. And Maureen Ryan expertly runs down everything that BSG cast members, writers, and directors are up to these days.